Much as I love my running gear, there’s one piece of kit that I always sneer at when I find it in my ‘lycra’ drawer whilst rummaging for something more exciting. My bright yellow safety gilet. I’ve never felt comfortable wearing it, as I dislike wearing such bright colours when running. When I run through fields, up footpaths and down bridleways I like to feel that I’m blending in, that I’m part of the environment, that I am able to get closer to wildlife than I would if I was in a car or even on a bike. Hard to do that when you look like a Health and Safety inspector. I also know (from discussions on the Run Mummy Run Facebook page) that I’m not the only runner to have discovered a huge drawback of wearing hi-viz if you’re ‘caught short’ in this season of bare branches and lack of foliage. Hem hem. Despite all of these reasons to shun the 90’s rave style fluro, I reluctantly put on my yellow hi-viz gilet yesterday when I went running. I was all ready to set off on yet another dingy, dismal day, wearing black running tights and top. As I was planning on running on some roads (as opposed to my usual quiet lanes), I decided I’d better put on my hated hi-viz as well. 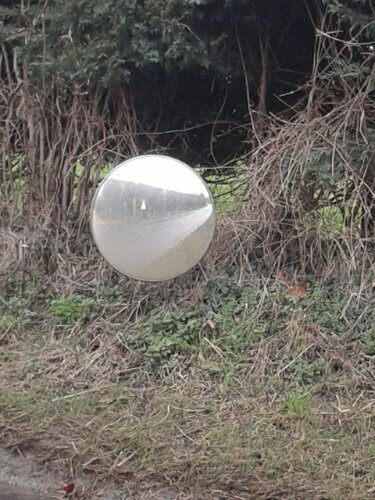 Running past one of those mirrors people put in hedges to help them pull out of their drives I was struck by how invisible I was, apart from my gilet. Can you see me? Or just my gilet? Seeing as this section of road is twisty and turny, has no pavements and has people driving along at high speed, perhaps I’ll wear it more often in future.